Craig Goodman – Principal Architect at CS&P Architects Inc. 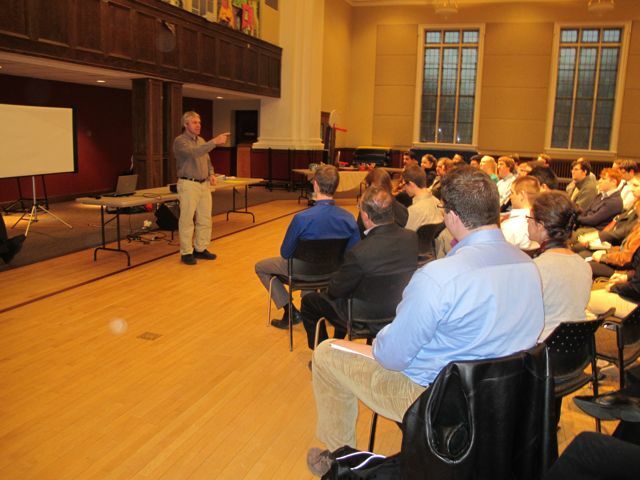 The event was attended by Carleton University students and professionals in the green industry. 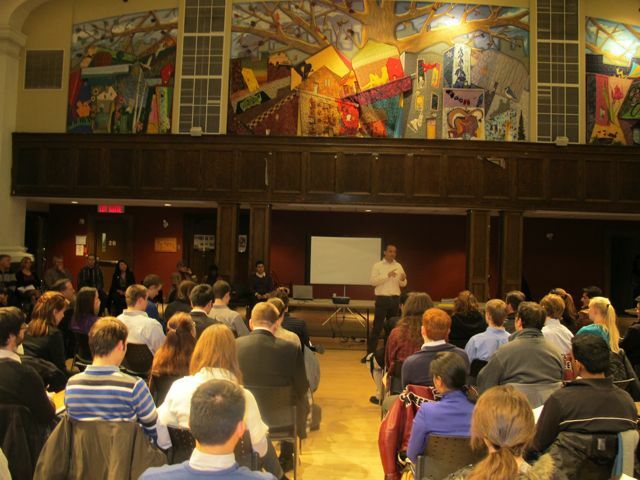 Special thanks to Liam O’Brien of Carleton University for getting us a lecture room for the event. Solar panels to heat 100% of the water for the pools. A greenhouse that grows fresh organic vegetables and herbs for use in the restaurants. Laundry at the resort is cleaned without chemicals, and 92% of the water is reclaimed and filtered/cleaned for other uses. Heat recovery recovers 98% of the heat used for drying to heat hot water for washing. Energy efficient air conditioners eliminate on/off cycling and reduce energy consumption by 50% over standard models. The resort is Green Globe certified (3rd party verified green rating system similar to LEED). 2) Mitigate the effects of travel. Travel is the part that is difficult when you head south. Nobody wants to spend their entire vacation in a car or train. Its pretty much airplane or nothing. When faced with no options for eco-friendly travel you need to take steps to mitigate the effects of your travel. Air Canada offers a great carbon offsetting program in cooperation with a firm called Zerofootprint. Not only can you offset your flights emissions, but you get to choose how they are offset. We chose to offset our emissions using a combination of planting trees and recycling tires. Planting trees removed carbon from the atmosphere and recycling tires cuts down on carbon as well as hazardous gases associated with burning tires (which is standard practice for tires not recycled). Terra20 in Ottawa sells sunscreen that is free of these chemicals. These are the eco-friendly decisions we made when planning our honeymoon. Our trip is scheduled for the end of October and I will try to grab some good photos of the eco friendly features at the resort while I am there. 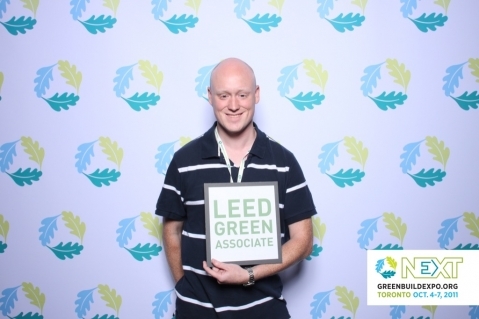 Posing for a picture at Greenbuild in Toronto a few months after earning my credential. Earning my green associate while I was still a student was a great career move. I wrote the exam while still in school and it helped me land a summer job in my field. I worked with Thermalwise in Halifax as a Green Building Researcher. In this role I developed case studies and video tours of green buildings throughout Atlantic Canada. I wanted to learn more so I applied for and won a scholarship through the USGBC and the CaGBC Atlantic Chapter to attend the Greenbuild conference in Toronto. Contacts I made at this conference helped me to land a job before I graduated with Morrison Hershfield in Ottawa as a Sustainability Analyst. During my last year of school I applied and was accepted for a 3 week student exchange to Ireland to work on a passive house retro-fit design project. My LEED Green Associate was a big talking point during the interview process and I know it helped me stand out and get selected. I worked with Irish, Scottish, German, Dutch, and Canadian students. Shortly after graduating and beginning work with Morrison Hershfield I earned my LEED AP with specialty in Existing Buildings (EBOM). To date I’ve been involved on over 10 LEED projects, including an EBOM project that is pursuing LEED Platinum. I wanted to be involved in Green Building outside of work as well. I joined the Ottawa Emerging Green Builders (EGB) committee and I have held a number of roles including finance director, vice-chair, and chair. I also joined the EGB National Committee as the Ottawa representative. I went back to Greenbuild in San Francisco last year, and I met with members of the USGBC’s Emerging Professionals and USGBC Students. We are now working together and sharing ideas across the border. Since then I have led the development of the EGB handbook which serves as a guide on how to start and operate a chapter EGB committee. Currently at Morrison Hershfield I have been helping out with LEED reviews for the CaGBC and will be taking over as leader of our LEED EBOM review team in November. I have also been working as the lead carbon verifier on some high profile greenhouse gas projects, and working as the lead quantifier on our own carbon footprint. I’m also working with our marketing team to help increase awareness of our carbon services and try to bring in new business. My LEED Green Associate started me on this path. It gave me a great story to tell in a job interview. It showed employers that I was serious about sustainability and proved that I am committed to continuous learning. It’s helped me get a career I can feel good about. Taking the exam was my first interaction with the CaGBC and it opened the door to the wonderful chapter community I found in Halifax and then Ottawa. It’s hard to believe how much has happened in the 2 years since I earned my LEED Green Associate. Part 1: Job presentations by each of the 11 companies in attendance (5 mins each). Presentations included information about the presenters, their companies, they types of jobs people do at their companies, and the types of skills that they value most. Each presenter took a different approach to this and the result was a diverse offering that even some of the industry professionals learned from. Part 2: Skills session – How to develop a portfolio (10 minutes). 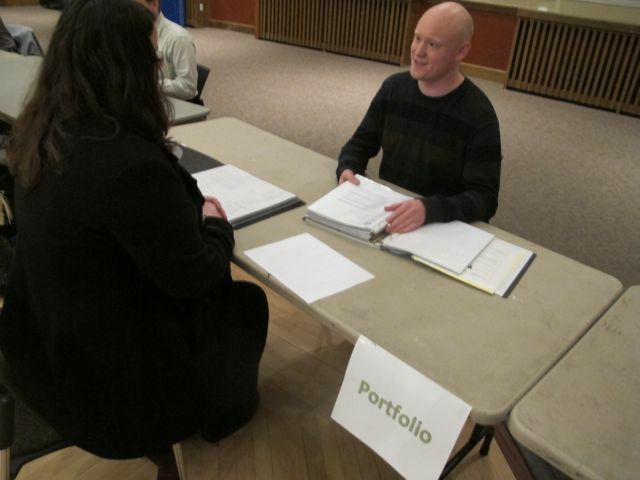 Portfolios are a physical representation of your skills, interests, and attitudes. They are often overlooked but can give you real edge in an interview because they support the claims on your resume with hard evidence. 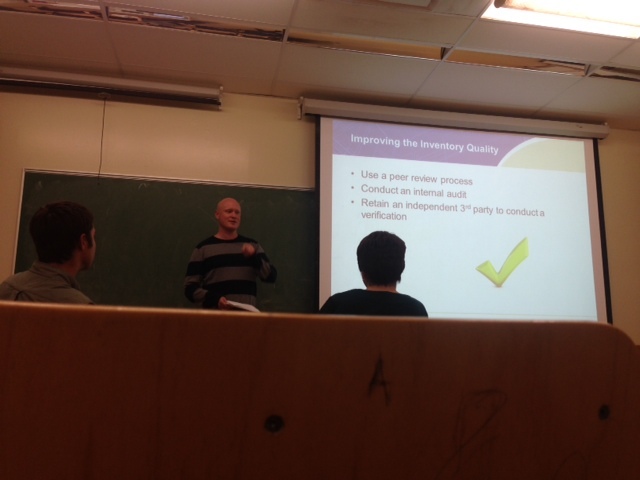 I presented on what can be included in a portfolio as well as the benefits they bring. Part 3: Speed dating – This consisted of 1-on-1 sessions between the industry professionals presenting in part 1 and 2 which lasted 3 minutes each. We fully intend to follow this advice and I can’t wait to make Green Jobs 101 even better in 2014! 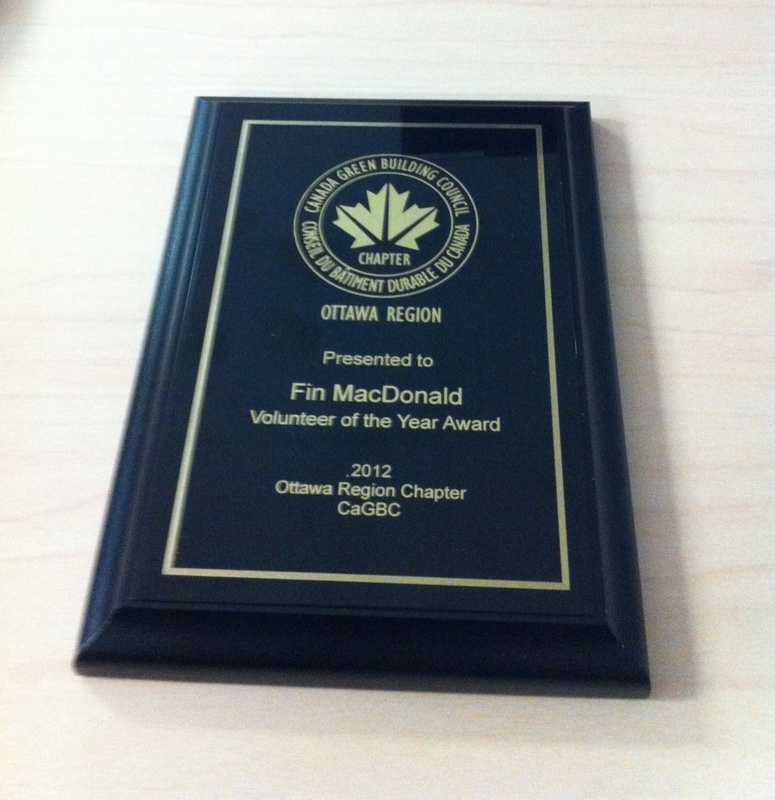 I was recently honored with the award for 2012 Volunteer of the Year by the Ottawa Region Chapter of the Canada Green Building Council. 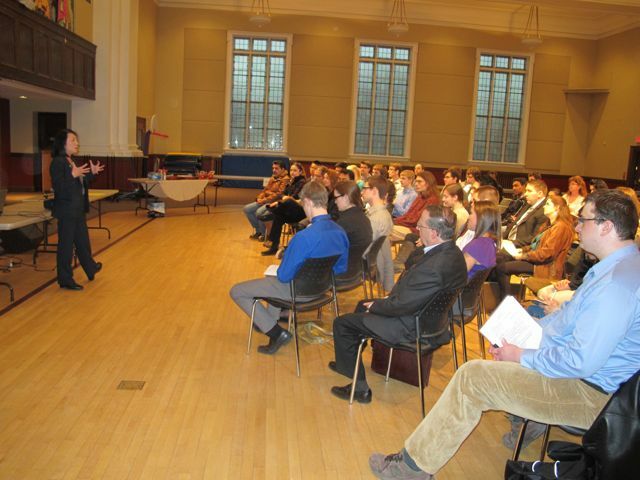 The Ottawa chapter is successful because of the hard work of a great group of volunteers. I was very surprised to receive the award at the annual general meeting. Thank you to everyone. I have been volunteering for the past year with the Canada Green Building Council’s Emerging Green Builders (EGB). 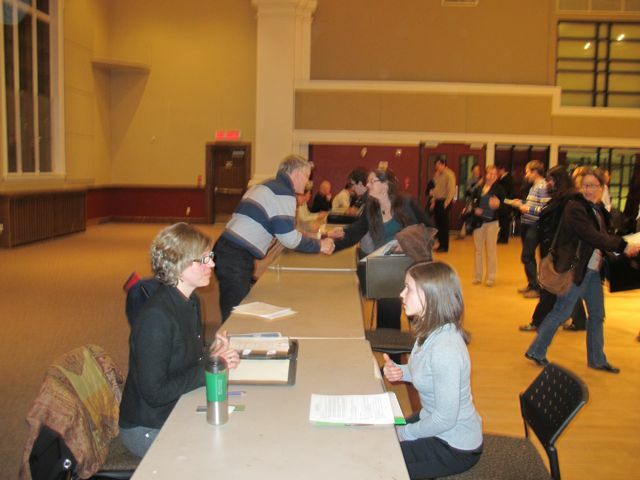 The EGB work with their local CaGBC chapters to put on events for students and new professionals. The main goal is to attract young and new professionals to the green industry. Another benefit of the EGB committee is that it allows new professionals to take on group leadership roles earlier in their careers, and is training the CaGBC leaders of tomorrow. I am currently the Vice-Chair of the Ottawa Region EGB, and in the past I held the role of Finance Director. 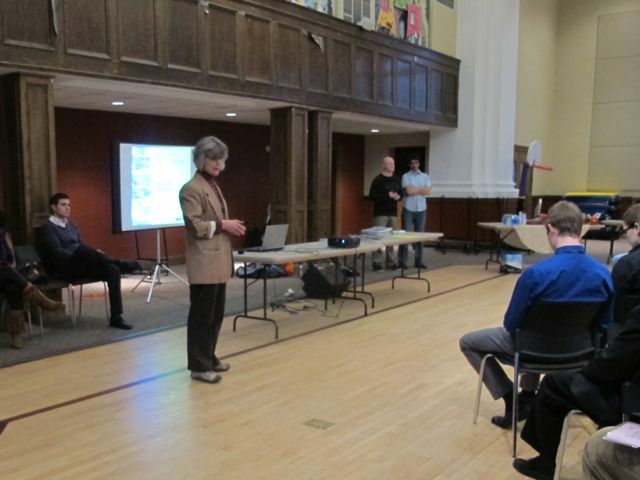 We also assisted the Ottawa CaGBC Chapter with the Eco-Logical student design competition. We will be running similar events again this year. We also have plans to host a Green Jobs 101 event which will showcase different green career options and give attendees the chance to discuss required skills and job opportunities 1-on-1 with industry leaders. 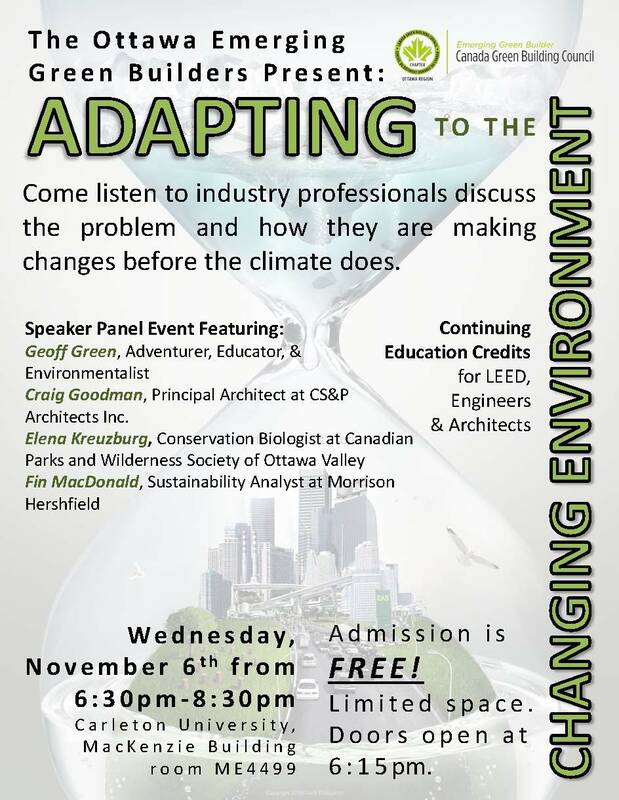 If you are interested attending events or joining your local EGB group, contact your local CaGBC chapter (http:www.cagbc.org). What Makes LEED for Existing Buildings: Operations + Maintenance So Great? I have been working on an existing building that is targeting LEED Platinum for the past few months. I believe that the greenest building is one that is already built. This rating system allows existing buildings to certify as green by making their operations as sustainable as possible. This is my first LEED EBOM project, and I’ve noticed 3 great improvements between this rating system and the one for new construction. The first big improvement I see is that most of the credits are based on actual performance rather than modeled or estimated performance. This rating system has an advantage because the building has already been built, but that doesn’t make it less great. Some of the areas you see this with are the energy consumption, water consumption, light pollution, and alternative transportation credits. The second big improvement is that tenants are engaged in the process. In a new construction job most LEED work is done before the tenants move in, but in LEED EBOM your success depends on them. Tenant purchases, commuting behavior, energy and water use, recycling and waste habits, and overall comfort all have an effect on how many credits the building earns. By involving the tenants you also get the opportunity to educate them on the affects their decisions can have on the buildings sustainability. LEED EBOM has the profound ability to affect behavior! The third big improvement is that certification is not for the life of the building, as it is with a LEED for New Construction building. LEED for Existing Buildings certification is only good for up to 5 years. At this point the building needs to re-certify in order to keep their plaque on the wall. This means they have to keep up the good work! The building is also able to try for additional credits every time it recertifies, and there is the opportunity to recertify at a higher level than before. This encourages continuous improvement. I have only been working on the job with LEED EBOM for the past couple months, but I’m sure I will find more things I like about the rating system as I go on. I’m looking forward to more exciting and engaging LEED EBOM projects. The hardest part about preparing for Greenbuild each year is choosing the education sessions you will attend. There are so many exciting ones to choose from. This year I am choosing sessions that fit into one of three categories. This session will inspire innovative ways to create green career pathways at community colleges. Presenters will spark an interactive discussion on how colleges can prepare students for green careers through both curricular and co-curricular opportunities. Participants will begin to outline action plans to bring these opportunities to their communities. Candy Chang is an artist, designer, and urban planner who explores making cities more comfortable and contemplative places. By combining street art with urban planning, social activism, and philosophy, she has been recognized as a leader in developing new strategies for the design of our cities. The Integrative Process is now a formal LEED Credit in v2012. Participants will learn the fundamental methods and benefits of utilizing the Integrative Process to achieve enhanced environmental and project performance, cost effectiveness, and value relative to conventional approaches in project design and real estate development. This session will compare the challenges of designing to meet the Living Building Challenge’s net-zero criteria in two different cold climates – Alaskan and Northeastern United States. Discussion will include project concepts/goals/expectations as well as the analyses used to determine which method of design was deemed best for each climate. The Green Assistance Program (GAP) facilitates community education about sustainable building operations while simultaneously greening an actual building. The San Diego Green Building Council has developed this innovative approach to LEED project management, combining elements of crowdsourcing and experiential learning to assemble a community-benefit LEED EBOM project team. We explore ecoBalance Design through a biomimicry lens to integrate balance as a pragmatic performance metric, and cycles as an overarching design discipline to sustain basic life support systems across life cycles (source/process/use/re-source), both informed by ecological frameworks. The session will engage participants to test-drive concepts and gamestorm examples. This session will explore how San Francisco’s City agencies are working to implement the City’s vision for complete, green streets through greater capital project coordination, creation of project manager resources, and development of a triple-bottom line analysis to assess design options, by leading participants in a real-life design problem. Permaculture is more than agriculture: it is a wholistic design methodology focused on developing human settlements that have the resilient properties of natural ecosystems. Tied into the essence of regenerative systems, permaculture design principles can play an important role in the green building communities, moving us towards a sustainable future. How do we create biophilic cities? Ones that are in tune with ecological systems, foster place-based relationships, and embody the attributes of nature in their design. This research paper presentation and discussion of biophilic principles will explore how to integrate these concepts into the design of our neighborhoods and cities. What if you could design a building that could think, move, react and adapt to real-time weather conditions? What if it provided more satisfied tenants, energy savings, and enhanced aesthetics. Learn more about emerging technologies and design principles that make dynamic facades the newest standard in green building and design. 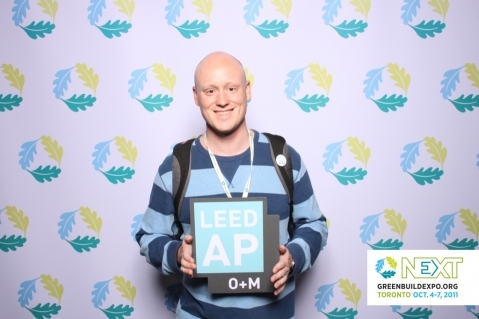 Last year I was fortunate enough to win a scholarship to attend Greenbuild in Toronto. While I was there I learned that the next year it would be in San Francisco. I was so jealous of those who would win the same scholarship for this year. I knew I wouldn’t be able to make it to San Francisco. I was wrong. 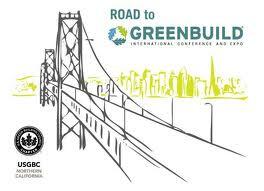 This week I registered for Greenbuild in San Francisco. I’m travelling with the Canadian National Emerging Green Builders Committee. I am the Ottawa Region Chapter of the CaGBC’s representative. The USGBC is allowing our group to volunteer 8 hours each in exchange for admission. This is reducing the financial strain quite substantially. I’ve also been able to book a flight using airmiles, and I found a hostel near the conference center for a steal of a deal. The theme this year is Build Smarter, and it is no coincidence that it is being held in San Francisco. The Silicon Valley is the cradle of technology, and this years conference is focused on how to use technology and modern ideas to improve the built environment. Greenbuild is of course much more than buildings, and this year more than ever there is a focus on neighbourhoods, cities, and human behaviour. I’m really looking forward to the networking opportunities, as well as the opportunity to meet my Morrison Hershfield colleagues from across North America. Its going to be an adventure, and when its over I’ll be able to directly apply my new knowledge in the workplace. Nov 14th – 16th, 2012. I can’t wait! Today marks a big achievement for me. I passed my LEED Accredited Professional exam with the Existing Building Operations and Maintenance (O+M) specialty. I have been studying for this exam off and on for almost a year now. My college exams and the European exchange trip I was on caused some major delays in writing. I put a big push on in the last couple of weeks to be able to write this before my summer vacation starts next week. The exam was very challenging and required memorization and application of a wide range of information. The reference guide for LEED O+M is over 700 pages long and the pass mark on the exam is 85%. There are a huge amount of buildings that have been constructed over recent years to the LEED standard, but this deals with construction only. How these buildings are operated is exclusive of that. Buildings that were constructed to LEED standards are eligible for LEED O+M, but so are buildings that were not built to LEED standards. Raising the bar on our existing building stock is a big step towards a greener built environment. I’m looking forward to applying my new credentials in the work place. I believe the next wave of LEED work will be for existing buildings. I am particularly interested in the greening of existing schools because of the impacts of green buildings on learning. I plan to seek out opportunities to improve the learning environment for students.